This is a martini especially for a fellow foodie and Twitter party friend of mine, Susan Irby otherwise known as @TheBikiniChef from The Bikini Lifestyles Show on KABC. While tweeting back and forth I discovered today is her birthday and she likes gin. Now Susan is all about the skinny and the healthy and I'm always for skinny and healthy in happy hour so I decided to put a little #SoBikini twist on a Gin Sour and create her a special birthday cocktail. I took the idea of a gin sour, added some lovely, seasonal fresh fruit in the form of watermelon then added a little punch with some fresh rosemary. A sour always consists of a base alcohol, some lemon or lime (or sometimes another citric fruit) and sweetener. Cocktails are often sweetened with sugar or simple syrup but, keeping with the healthy, I used honey instead. Honey brings the sweet but it also brings some great health benefits to a cocktail, as does the watermelon and the rosemary. I figure if you're going to be happy at happy hour, being healthy makes that a whole lot easier! So, a very happy birthday to you, Susan and Slàinte! Chill your glass in the freezer. Warm the honey for a few seconds in the microwave. Muddle a few leaves of rosemary with the lime and honey in the bottom of a cocktail shaker. Add ice to the shaker, pour in the gin and stir. 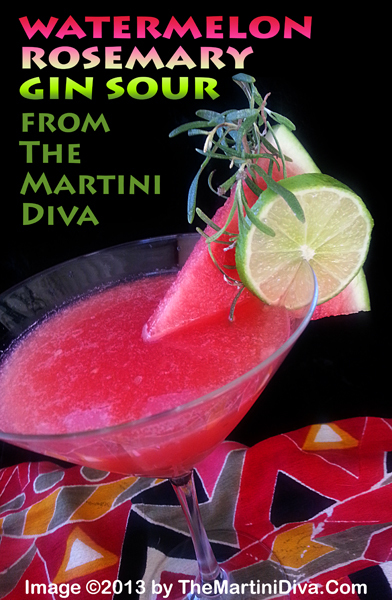 Add the watermelon puree then give it all a gentle stir, strain into your chilled glass, garnish with the rosemary, lime and slice of watermelon and enjoy!